303 Indoor And Outdoor Protectant - 16 Oz. Liven up your patio or pool area and enjoy a pleasant time outdoors with the Aruba II Sling collection from Telescope Casual. Vinyl coated polyester sling material dries quickly, making this stylish patio furniture comfortable, durable and perfect for use around pools and beaches. The frame is made from a highly durable, lightweight aluminum, covered in a powder coat finish that is weather and rust resistant making it an ideal material for outdoor furniture. The chair height is designed perfectly for use with outdoor counters and counter-height tables. Telescope Casual uses stainless steel hardware for added strength and durability. Telescope Casual warrants their powder coat aluminum frames and marine grade polymer frames from failing structurally during normal usage for a period of 15 years from the original date of purchase. Telescope warrants their powder coat finishes against peeling, cracking or blistering for a period of 3 years. 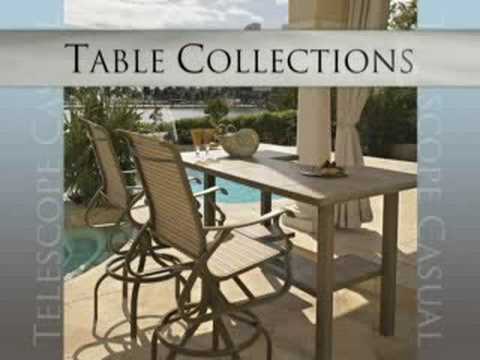 Non-Glass table tops are warranted for 3 years from the date of purchase, except Werzalit table tops, which are warranted for 1 year. Wood furniture, cushions, slings, and folding aluminum furniture are warranted for 1 year. Wicker fibers are warranted for 3 years. Warranty varies for commercial usage, please see the full warranty for more details.